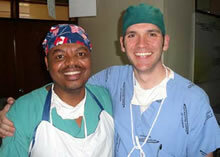 Dr. Love at Soddo Hospital with Dr. Tewodros Tamiru, a graduate of Soddo's PAACS residency. Emory medical resident Dr. Timothy Love was the inaugural recipient of the GO-TRAVEL (Global Outreach Traveling Resident Award to Visit, Experience and Learn) award, which allowed him to spend six weeks in Ethiopia completing a clinical rotation in surgery. He divided his time between Soddo Christian Hospital — located in its namesake city in the densely populated Wolaitta region of the country — and Myungsung Christian Medical Center in Addis Ababa, Ethiopia's capital. During his stay Dr. Love also traveled to Bahir Dar in northwestern Ethiopia for the annual meeting of the Surgical Society of Ethiopia, where he presented research involving a trauma registry that he and Dr. Jonathan Pollock, director of the Emory Global Surgery Program at Soddo Hospital, had established at the facility. The Global Surgery Program features a rotation for Emory general surgery residents, who train alongside Ethiopian surgical residents enrolled in the hospital's Pan African Academy of Christian Surgeons (PAACS)-sponsored surgical residency. GO-TRAVEL was conceived and funded by the Emory University School of Medicine Alumni Board to support resident education and to provide unique international training experience where fellows will get the chance "to experience disease processes you simply do not see in the United States," according to Dr. Farzad R. Nahai, president of the board. Dr. Love is already familiar with Ethiopia and its multiple healthcare crises, from widespread poverty and disease to a dire shortage of trained doctors. He first visited the country more than ten years ago while working on an HIV/AIDS research project as an undergraduate, and has returned several times, most recently in 2013 as an NIH Fogarty Global Health Fellow doing a feasibility study of the establishment of cancer epidemiology and registration in low-resource settings. He hopes to live and practice in Ethiopia full time when his training is completed. With part of his modest GO-TRAVEL award, Dr. Love purchased and provided surgical textbooks to the Ethiopian residents with whom he worked at Soddo Hospital. "Every Ethiopian medical library I've been in has been filled with textbooks from the 1980s and 1990s. Hard copies of up-to-date textbooks are almost impossible to come by, and they devoured them," he said. Upon his return, Dr. Love presented his findings to the Alumni Board in order to inform the application and selection process for 2015. A call for applications for the 2015 GO-TRAVEL award will be sent through all clinical and basic science departments this spring. The Alumni Board will select the recipient. For more information, contact the SOM Alumni Office at 404-727-0462 or email medicalalumni@emory.edu.